Power on the move - Mains Tester Plug Tests Supply Live, Neutral and Earth Connections. Quantity 5 In Stock Now (discount, if shown, is limited to this quantity). Mains Tester - latest version from W4. Simply plug into a 13amp socket and the tester will check the following: reversal of live/neutral connections, reversal of live/earth connections, no earth, no neutral, OK. Particularly important for touring on the continent when reversed polarity may be encountered. Specification: 230volt AC. For use in 13amp outlets. 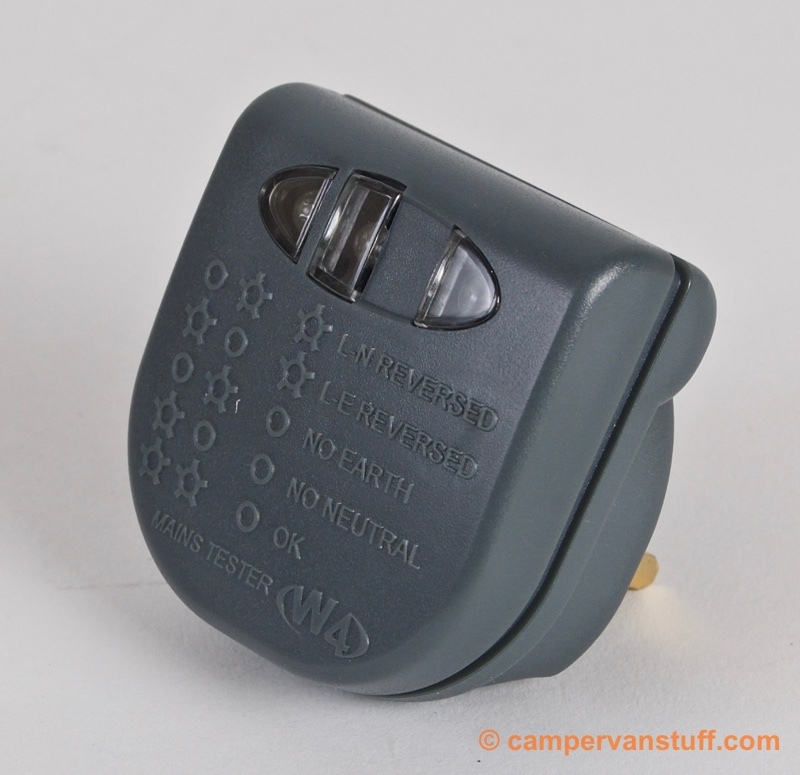 Even though our motorhome has double-pole earth leakage circuit breakers in its 230v system we prefer to check that all is well with the supply from the hook up; after all there could be an earthing fault in the supply. This tester has three LEDs which instantly display the status of the connection; so you can check at a glance that all is well. And while it is most likely to be a continental site where you might encounter reversed polarity, it's worth remembering that this can occur in the UK as well, despite it being contrary to regulations here. Our tester plug once picked up this fault on our pitch at a major Camping and Caravan Club site; we reported it to the wardens and were able to move our cable to a different EHU post.